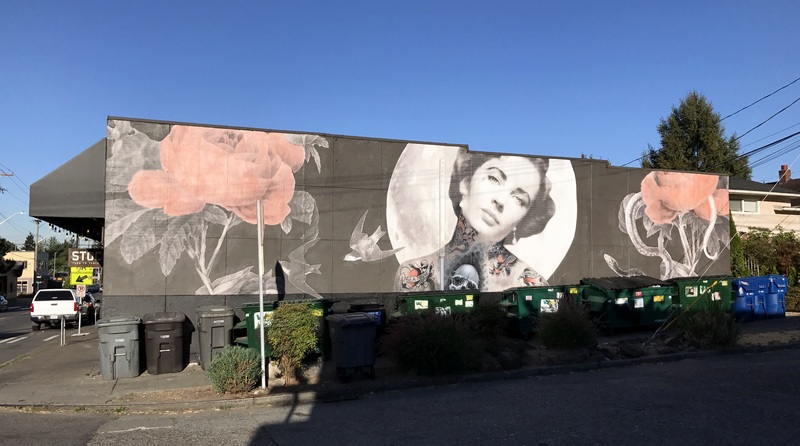 Over the last several weeks, I have watched a mural of Elizabeth Taylor take shape on the east side of the building that is home to Stock, Slave to the Needle, and The Tin Hat. I caught up with one of the artists, Aaron Bell (Facebook: @aaronbelltattoofriends), and he shared a bit about the composition. Photo of Aaron Bell and mural. Aaron also shared that he has received positive feedback regarding the project. No surprise, the mural is amazing! I love the old Hollywood design, thoughtfully blended with artistic tattoos. It truly enhances West Woodland’s Historic NW 65th Business District. Thank you Cheyenne, Aaron, and Elijah! Great addition to our neighborhood! Photo of Aaron Bell courtesy, Aaron Bell Tattoo Friends Page.